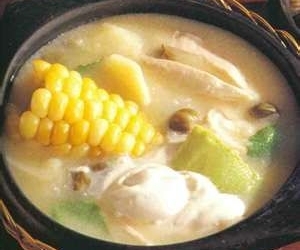 Ajiaco de Pollo is a Colombian food recipe of stew with chicken, corn and potatoes. Place chicken legs, cubed potatoes, water, salt, and pepper into a large saucepan and bring to a boil. Add half of the basil leaves. 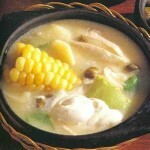 Turn down heat and simmer for about 11⁄2 hours until potatoes and chicken have fallen apart, thickening the broth. Add new potatoes, boneless chicken, corncobs, and remaining basil. Simmer for 15 minutes, or until done. Add peas and simmer for another 5 minutes. Turn off heat. Slice avocados into cubes. To serve, distribute all items evenly among dishes. Garnish each serving with a tsp of capers, a tbsp of cream, avocado, and basil.